On his visit to the Communication Leadership program, scholar and author Kentaro Toyama gave a public colloquium on the development of his book, Geek Heresy. After an introduction by Department of Communication faculty Caley Cook, Toyama dove into his experience with applying tech solutions to social problems in India and broke down his theory on the law of amplification. The Communication Leadership program held an intimate lunchtime salon with Geek Heresy author and UMSI associate professor Kentaro Toyama. After an introduction from Director Hanson Hosein, Toyama and the students in attendance discussed the book and questioned technology’s ability to truly affect change in the world. Written by Flip the Media. Featured image by Jacob Christensen. On paper, Kentaro Toyama (@kentarotoyama) is an associate professor, a computer scientist, and a former Microsoft researcher. In practice, he’s something closer to being a social problem solver, with a keen interest in international development and how technology interacts with society. He also happens to be the author of a book titled Geek Heresy: Rescuing Social Change from the Cult of Technology which serves as the Common Book for the Communication Leadership program’s 2015-2016 academic year. Last week, Toyama himself visited the University of Washington campus to talk about his book, his views on technology and what it means to be a geek heretic. To kick off Toyama’s visit to the UW, he spoke with CommLead students and other guests for a salon chat with Communication Leadership Program Director Hanson Hosein. Over lunch, they discussed the issues raised in his book, and how it has been received by the community. While Toyama said the response to his book has been mainly positive, his views are a long way from becoming the dominant thread of conversation. In some cases, it is because of the inability of leadership to perceive the real situation on the ground. Jokingly, Toyama suggested that “Leadership Communication,” or communicating key issues to leaders, might be a more apt program focus. Another issue is that humans are hardwired to be interested in the next shiny thing, of which technology has an amply supply. The lunch meeting also provided proof that Toyama walks the talk: he eschews a smartphone in favor of a more basic model. After lunch, Toyama went on to give a colloquium in the Communication building to a small audience of students and faculty from across the university. Toyama talked about the of “law of amplification,” a primary concept in his book and the explanation behind the fact that a computer in a classroom in a private school in Seattle will produce a different outcome than a computer in a classroom in low-resource school in India. The outcomes, Toyama explained, depends not in the technology but in the people who use it. Technology only amplifies underlying human forces. Flip the Media contributor Laura Gomez caught up with Toyama after his colloquium for a brief interview. I felt compelled, when I was still in India and I was beginning to see this pattern of technology amplifying human forces. At the time, I was surrounded by people who felt that more technology and more innovation was going to solve social problems. And you know, as I gained more experience, it seemed like it wasn’t the case. I just felt compelled to tell everybody that technology is usually not enough. It was difficult. That took me three years. So I took two years to write the book, physically, and three years in the middle to find a publisher. Why do you think it was hard? I learned through this process that publishers are looking for three things. One is what they call a platform, which is a sufficiently high profile that they think people will find you interesting enough to buy the book. So it could be that you have a lot of expertise, which is probably my case. It could be that you’re famous, which is why a lot of celebrities write books. It could be because you have had a truly unusual experience that nobody else has. Any of these things, but some reason that causes people to think “this is the right person for this book.” That’s a platform. Number two is the topic of the book. There, I think, I was on the losing side, because even though people are interested in in technology, the average American reader is mostly not that interested in international development or social causes or things like that. And so the fact that it was about technology helped, but the fact that it was about international development made it less interesting to publishers. The third thing is the actual writing itself. Even in my first draft, I knew that I had to include a lot of stories to make my point. but what I didn’t realize was just how much the story is important to the publishing industry. In fact, I would say the story is so important to the publishing industry that they don’t care that much about the logic of your argument. What they want is good stories. It took me three years to both understand that and rewrite my proposal such that it was in line with that. Did finding this pattern in India changed your career? Yes. When I went to India, I was still doing technology projects, I thought of myself as a computer scientist. Now, I don’t think I’m a computer scientist first. I’m not sure how to describe myself, because it’s inaccurate to say I’m a social scientist, because that’s really not my training and not where my expertise is methodologically. But I’m interested in social questions, some of which have to do with technology but ultimately more about how to help people achieve their aspirations. I’m very fortunate to be in a very interdisciplinary school, of which all of the things I am interested in are also of interest to the school. I feel like I can do the research that I want. I am very deliberately and consciously trying to grow away from technology. Do you think developed countries should continue to keep pushing the rest of the world to learn about technology, and try to develop them, or wait and let them find their own way to development? That’s a very deep question, and I am not a hundred percent sure of the answer. What I currently believe is that there are ways in which we from the Western developed world can help. The best way to help is by adopting the same mentality as a good mentor. What makes a mentor good is, first of all, they do not have an agenda for themselves. They are not trying to get anything by mentoring somebody else. They also are very respectful of the protege’s own aspirations, and they try to nurture the protege in a way that helps them achieve their aspirations on their own. The mentor can provide social connections, provide some advice, in some cases provide a little bit of resources, but the idea is that it’s all about nurturing the human being. I think that approach is the right approach, and I think that it works by analogy, and we can even do it from nation to nation. As long as it is done in that way, I think development is both valuable and helpful. 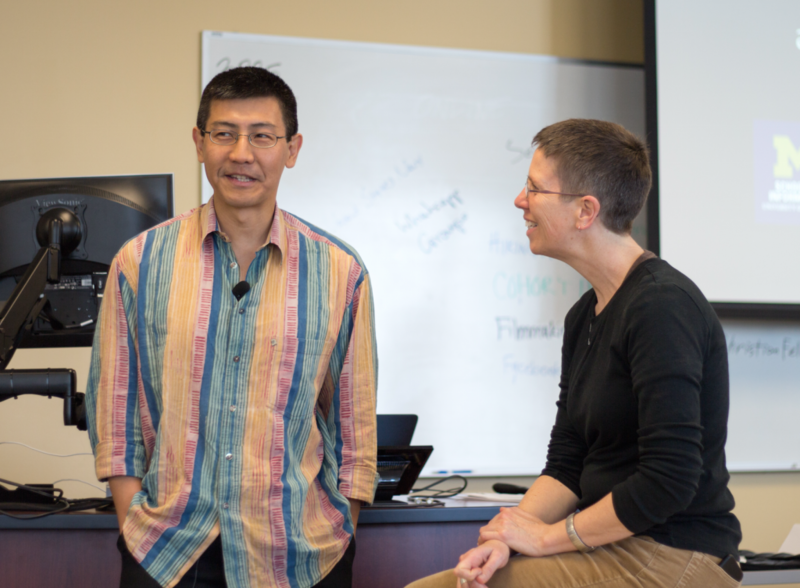 Kentaro Toyama and Anita Verna Crofts, associate director of academic affairs for the Communication Leadership program. Photo courtesy of Jacob Christensen. Finally, Toyama concluded his visit at the UW with a talk delivered to Cohort 15 in their core class under Senior Lecturer and Associate Director of Academic Affairs Anita Verna Crofts. The class has been working with Toyama’s book during the quarter, and they were in a unique position to reflect on how Toyama’s words might influence their future practices as communication leaders. 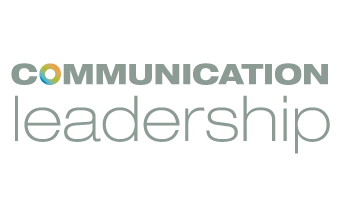 “Learning the ins and outs of the digital world is a major component of the Communication Leadership program, but it is not the most important factor. Communication and leadership drive the program and Kentaro Toyama emphasized how significant both are,” one Cohort 15 student, Dae Smith, noted. The post A Geek Heretic in Seattle: Kentaro Toyama at the UW appeared first on Flip the Media.